The LTR Series is a standalone video archiving recorder fitted with an LTO (Linear Tape Open) drive. By adopting enormous volume of Terabyte and capability of LTFS file data, LTR series recorders can be used as platforms for material or program exchange. This series offers many useful features, including HD/SD-SDI input/output, broadcast quality codec and MXF (OP-1a) wrapping and unwrapping. 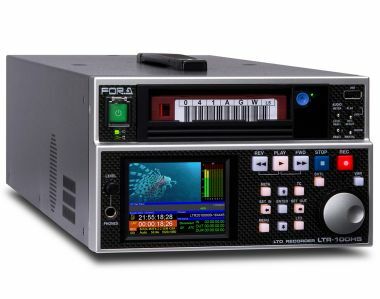 MXF files recorded on LTO can also be used with non-linear editing systems. LTR-BMAC-E (Apple MacOS) or LTR-BWIN-E (Windows) => must be specified when ordering! => Alle aktuellen FOR-A Produkte bei uns erhältlich! => Klicken Sie hier für eine Übersicht der aktuellen Workflow-Möglichkeiten, die Ihnen FOR-A bietet!